With preparations for Expo 2020 Dubai well underway, the true long-term impact of the event is starting to become apparent. A few months back, the organising bureau unveiled plans for its Sustainability Pavilion, part of Expo’s strategy to promote a “greener and cleaner future”, which it hopes will provide inspiration for a new generation of “guardians of the earth’s welfare”. The structure will take a substantial amount of its energy and water needs from the sun and atmosphere, one of the world’s first large-scale applications of such technology. It will be a tangible testament to the focus and progress made in the field of sustainability in the UAE, and at the same time, showcase global best practices. Expo has recruited a world-class team of architects, designers and experts from the fields of ecology and technology to design the Sustainability Pavilion, which is expected to attract some 30,000 visitors daily. When the event concludes in April 2021, the venue will transform into a permanent science ‘Exploratorium’. It is just one example of how Expo is slowly but surely putting together the pieces of an intricate puzzle that when completed, will reveal a blueprint for economic sustainability. In the latest show of support for Expo’s legacy strategy, Siemens AG, one of the world’s largest high-tech manufacturing firms, revealed plans to establish its global logistics headquarters at the Expo 2020 site. The German company will locate some of its key businesses at the 4.38-square-kilometre site in Dubai South to capitalise on the industrial and logistics developments in the emirate. This will ensure the Expo site fulfils its brief as a destination for businesses, residents and tourists alike after the event closes. Expo management anticipates that more world-class companies will follow Siemens’ example, bringing new jobs and business to the developing area in Dubai South. Siemens will leverage existing infrastructure including the Expo’s permanent buildings as it makes a new home for its global logistics headquarters. The new HQ will house Siemens’ airports, cargo infrastructure and ports teams. All levels of value addition will be represented in Dubai including global management and strategy, research and development, innovation, software development, sales, assembly, and production. Expo organisers have also named Siemens a Premier Partner for Intelligent Infrastructure and Operations, providing a wide range of innovative solutions, technologies and products to help plan, build and operate an exceptional Expo that will continue to make a meaningful impact well beyond its closure. Under the partnership, Siemens will also provide smart solutions for Expo 2020 technical and site operations and implement Mind Sphere, an open operating system for The Internet of Things. Mind Sphere will initially be utilised for optimising energy management and building management across the site. Mind Sphere will enable Expo organisers, Siemens and other partners, small and medium enterprises and universities in the wider Expo ecosystem to make best use of data received. Inspired by Dubai’s Vision 2021 and the Expo themes, the two parties will also promote the use of Mind Sphere outside Expo as well as for the 200-plus participants of Expo 2020 Dubai. His Highness Sheikh Ahmed bin Saeed Al Maktoum, chairman of the Expo 2020 Dubai Higher Committee, says Siemens’ decision to set up its global logistics headquarters at the site after 2021 represented a major milestone in Expo’s journey. “It’s a vote of confidence for the strong viable legacy plan for the Expo 2020 site and confirms the global role Dubai plays as an international hub for business and the logistics, aviation and maritime industries,” he says. Siemens has a long history in Expo partnerships according to its CEO, Joe Kaeser. “Through this collaboration, we look forward to supporting Dubai’s sustainable development goals with our innovative solutions, helping bring the emirate closer to its ambition of becoming one of the world’s smartest cities,” he says. The company’s managing board member and chief technology officer, Roland Busch, says the move to Dubai will bring Siemens close to its key customers and markets. “The Expo site will be a perfect match, featuring state-of-the-art facilities, infrastructure and technology, coupled with enviable transport connections,” he adds. Siemens employs around 351,000 people worldwide and in 2016, generated revenues of around EUR 80 billion (US$84.8 billion) last year. The company was ranked 51st in the Forbes 2000 world’s biggest public companies list of 2016 and 71st on last year’s Fortune Global 500 list of companies with the biggest revenues. The Expo site is located near Dubai’s thriving Al Maktoum International Airport, which will be expanded by 2025 to become the busiest in the world with some 220 million passengers envisioned annually. It is only an hour’s drive from both Dubai and Abu Dhabi international airports and is well connected by road and metro links. Siemens’ corporate headquarters are based in Munich and Berlin. The company has operations in around 190 countries with 285 production and manufacturing facilities. Several businesses within Siemens support many of Expo 2020 Dubai’s key themes of sustainability, mobility and opportunity. Its portfolio focuses on the areas of electrification, automation and digitalisation, making it one of the world's largest producers of energy-efficient technologies. 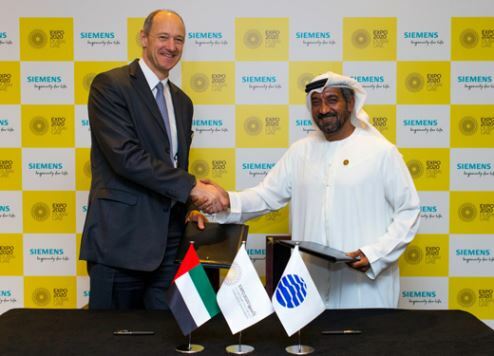 Siemens joins DP World, Emirates, Etisalat and SAP as an Expo 2020 Dubai Premier Partner. Further important commercial partnerships are expected to be announced by Expo in the coming months.